Who doesn’t love a free concert? But, also, who doesn’t like waiting in traffic on their way to or from a free concert? We suspect the answers are almost nobody and almost everybody respectively. The good news is that tonight is the first free Pier concert of the summer. And even more good news: there are now more options to get there, so you can leave your car at home and avoid the traffic and the costly parking. With the free Pier concerts happening every Thursday through the summer, this is something to keep in mind. You all may have heard that Santa Monica got a brand new light rail line in May when Expo phase II opened to Downtown Santa Monica, connecting the seaside city to Downtown Los Angeles and the region’s growing transit network. The Downtown Santa Monica Expo station is only four short blocks from the Pier, making it a pretty convenient option. If you are coming from a place that’s not near an Expo line station, chances are you are near a Big Blue Bus stop, and the Big Blue Bus connects to the Expo line at the Westwood, Bundy, 26th Street (Bergamot), and 17th Street stations. Or you can take Big Blue Bus lines 8, 7, R7, 3, R3, 1, 2, 5, 9, and 18, all of which stop within a few blocks of the Pier. 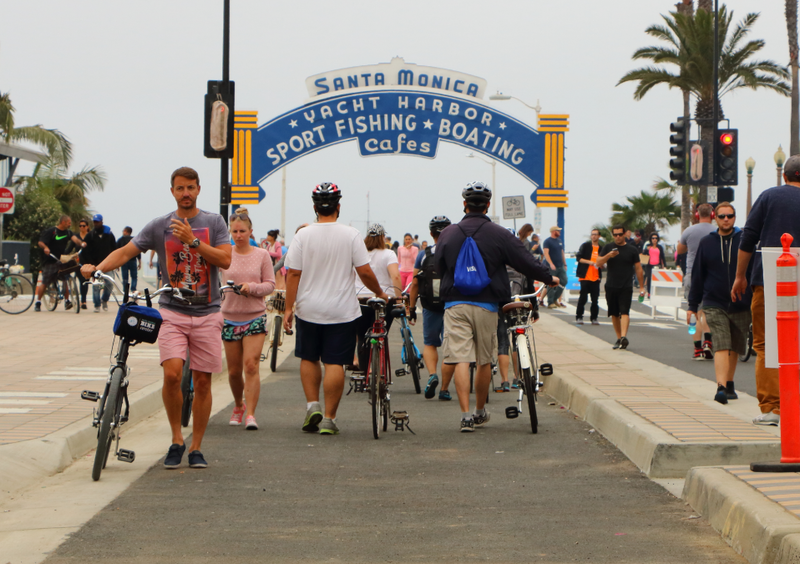 The reality is that here in Santa Monica, we have options, so why get stressed out sitting in traffic in a car when you could take a bus, a train, a bike, walk, or any combination of the above and skip the headache? It will certainly make the concert going experience better for you.